Since 1891, St. Bernard has maintained the tradition of providing a quality education to generations of students. Such an education entails the development of the whole person in Body, Mind, and Spirit. Our purpose is to help students reach their full potential intellectually, socially, physically, and spiritually. Administered by the Benedictine Monks of St. Bernard Abbey, the school offers its students, grades 7-12, a co-ed environment steeped in Catholic Christian tradition. 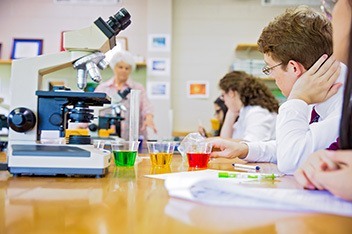 In our college-preparatory curriculum, the liberal arts are highlighted: languages and literature, history, mathematics, science, theology, and the arts. We emphasize the ability to think, to read with understanding, to express oneself with precision and grace, and to solve problems creatively and effectively. The St. Bernard student consistently scores well above the national averages for college placement tests, including the SAT and ACT. With 100% graduation rate, most graduates attend their first choice of prestigious colleges and universities across the country. St. Bernard is accredited by the Southern Association of Colleges and Schools, and a member of The Association of Boarding Schools, the Southern Association of Independent Schools, and the Secondary School of Admission Test Board.